Fast introduction into installing an Ignite-UX install server for HP-UX. Now install Ignite-UX. 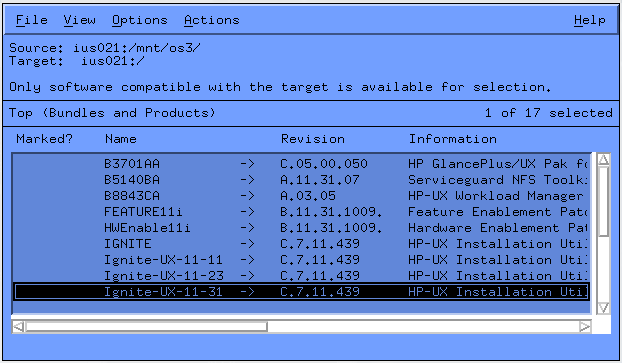 You can find the Ignite-UX depots on the HP-UX 11.31 OS DVD #3. Or use the NFS share, which was created above. Mark Ignite-UX-11-31 (or IGNITE for all OS versions). Check if the NFS server daemon is running. If not enable it. The same procedure for tftpd . If you are using an external DHCP server with PXE capabilities you don’t need to enable BOOTP on the Ignite-UX server. By default you don’t need to change the settings in /etc/inetd.conf. Setup PXE with Ignite-UX settings on a Microsoft DHCP server. The most important settings are Option 66 Boot Server which should point to the Ignite-UX server and the Boot File Option 67 which should contain „/opt/ignite/boot/nbp.efi„. That’s it ! Now you should be able to boot the Integrity VM over network and run the HP-UX setup. Greetings from Texas! Great info thanks for posting, just found your blog while looking for a photo of an EVA4000. I will be back to consume all this great info, thanks again for posting, Can’t be hp gear when it come to enterprise class technology!